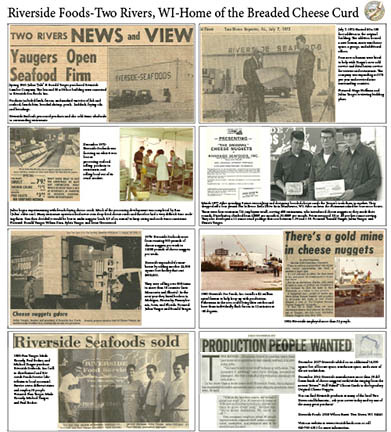 Riverside Foods is a family-owned company in Two Rivers, WI. We take personal pride in everything we do, from developing first-class appetizers and seafood to providing extraordinary customer service. For over 50 years, our mission has been to efficiently manufacture and market the highest quality products that are leaders in customer satisfaction. Here at Riverside Foods, we are always looking to improve and to exceed our customers’ expectations. Everybody loves cheese curds: fresh cheese curds, melted cheese curds, and the finest of all DEEP FRIED CHEESE CURDS! There is nothing more flavorful than a melty-fresh, squeaky Cheese Curd plunged into crunchy breading, smooth batter, or our Legendary Leinenkugel’s® beer batter. Cheese Curds on top of burgers, chicken breasts, or Cheese Curds on nachos. Share Cheese Curds with friends or indulge in them all by yourself. Serve up Cheese Curds as an appetizer, Cheese Curds as an accompaniment to a main course, even Cheese Curds on top of a main course. Dip Cheese Curds into favorite sauces such as: garlic cream cheese dip, herb and garlic ranch, raspberry inferno sauce, cranberry citrus ranch. Every Cheese Curd we manufacture is made from rBST- free milk of the greenest pastures in Wisconsin, America’s Dairyland. Riverside Foods Inc. has created TWENTY-SEVEN different varieties of breaded and battered Cheese Curds and nuggets in order to satisfy your every craving and desire! From our Original Cheese Nuggets to our “Famous” Homestyle White Cheddar Cheese Curds, we have breaded, battered or ovenable Cheese Curds that will grow your sales and keep customers coming back over and over again. Homestyle White Cheddar starts with squeaky fresh white cheddar cheese curds from Wisconsin lightly battered and dusted with a delicious Homestyle breading finished with just a touch of garlic for an added BAM taste! Kettle Brau™ Cheese Curds begin with fresh Wisconsin white cheddar cheese curds drenched in legendary handcrafted Leinenkugel’s beer batter. Italian Crusted White Cheddar begins with savory white cheddar cheese curds coated with Italian spices, Parmesan, Romano, garlic and parsley for a one-of-a-kind cheese curd experience. Trivers’™ Half Naked™ cheese curds start with squeaky fresh premium yellow or white cheese curds that are barely covered with a golden coating. Caprese Style Mozzarella with Tomato Basil creamy and rich mozzarella cheese breaded in Italian crumbs and tomato flavor. GET ADDICTED TO OUR CHEESE CURDS!! Looking for ways to promote the sales of our Natural Cheese Money Makers? Feel free to contact us and we will be happy to send table tents or sell sheets to make this your most profitable year ever. **For more information on any of our other Innovative Appetizers and Legendary Seafood, please contact us at 800-678-4511.